M&H Architectural Concrete Division Polishes Off More Awards! 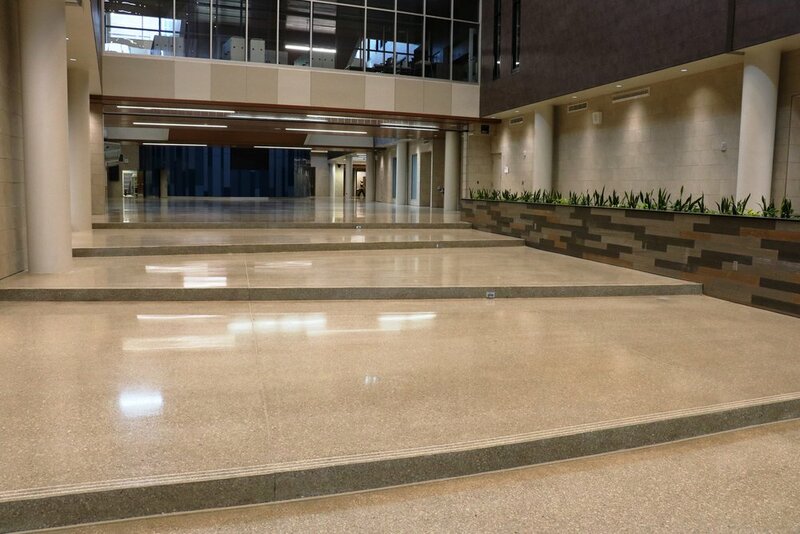 The entry, corridors, common spaces, and cafeteria of the new, 370 thousand square foot, state-of-the-art high school was finished with a polished concrete topping slab installed by Musselman & Hall Contractors. 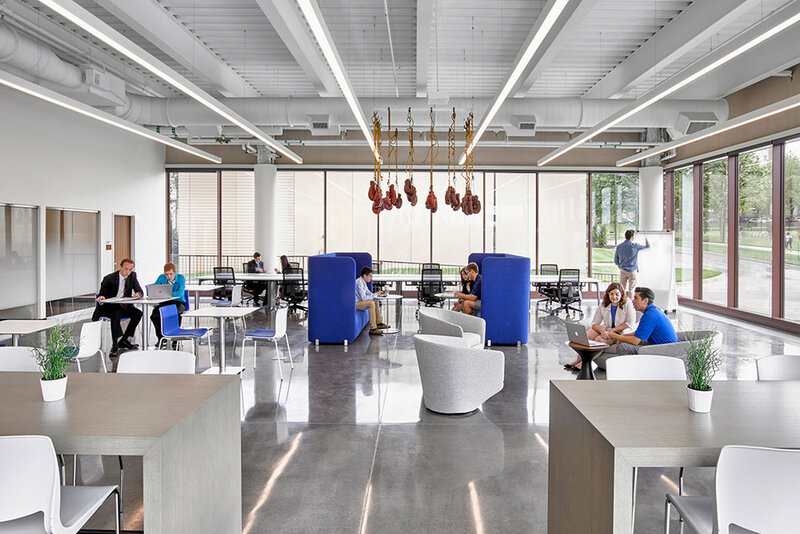 M&H worked with design firm Hollis + Miller Architects to meet the design intent. The finished product is an amazing testament to quality decorative concrete. M&H placed 25,000 SF of 2” thick, unbonded, concrete topping slab. After the topping slab had cured sufficiently, M&H began the polishing operation. 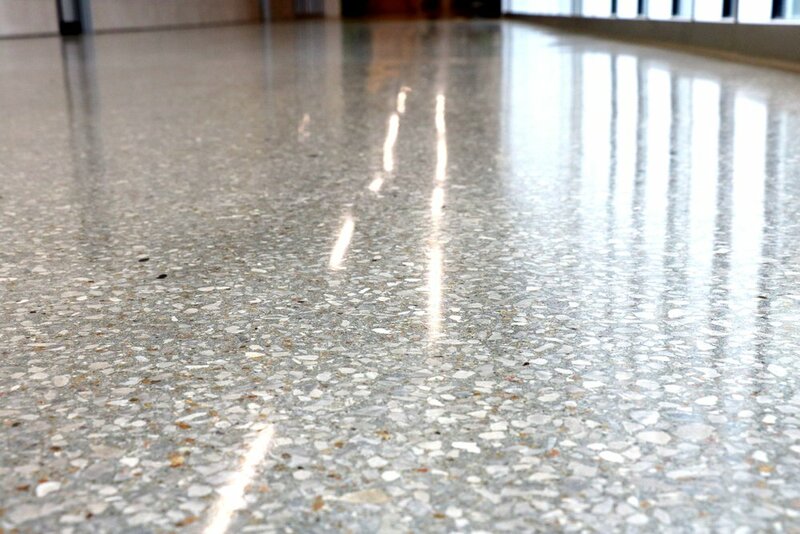 The slab was ground to a course aggregate exposure and polished a semi-gloss finish. Travis Downing, Kyle Kelly and the rest of the McCown Gordon Construction team were fantastic to work with and made the success of the project possible. Musselman & Hall is very proud of this project. 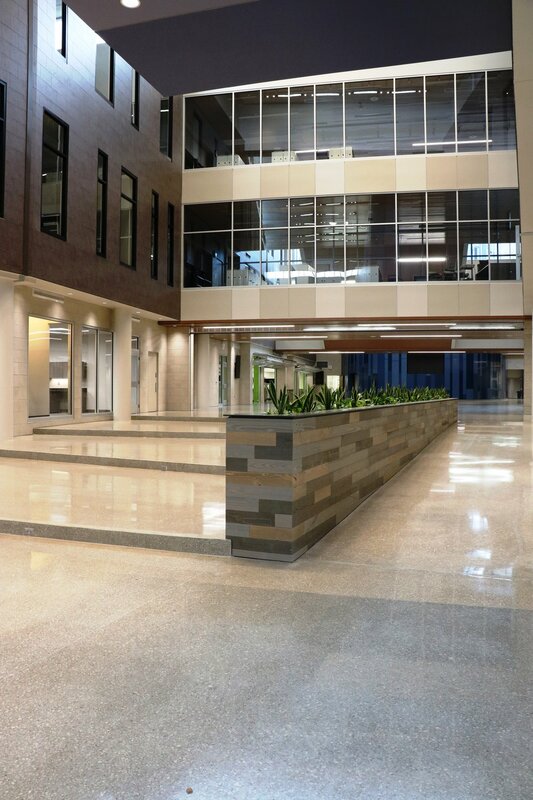 The Olathe West High School project was recognized by the Concrete Promotional Group for the 2017 Excellence In Concrete Awards - Judges Award. 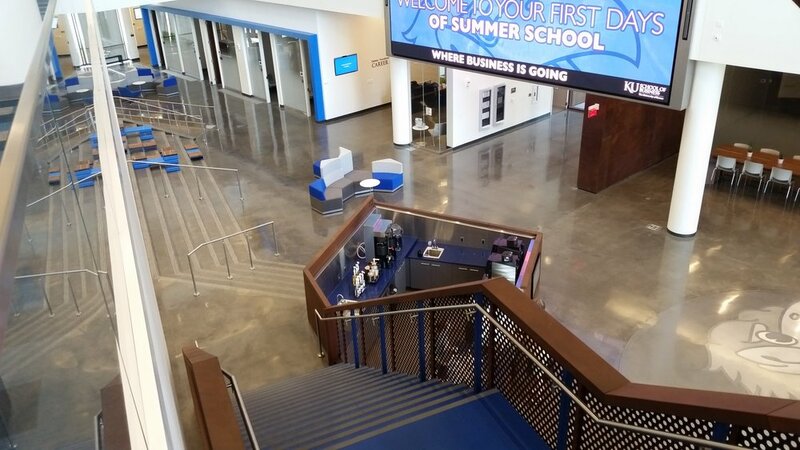 Recently we returned from the World of Concrete in Las Vegas with a National award from the Decorative Concrete Council for the KU School of Business Capital Federal Hall project winning 2nd place for polished concrete over 5,000 SF. 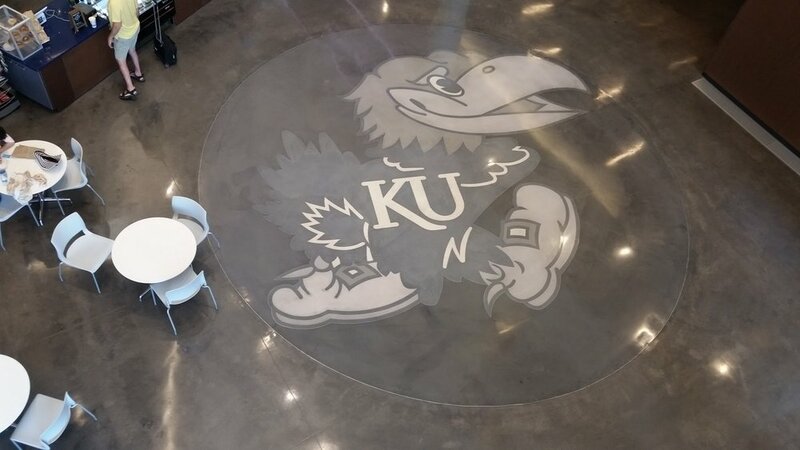 The project consisted of 15,800 SF of 4" thick integrally colored concrete topping slab and a 24' diameter Jayhawk symbol in the west entry of the atrium lobby. We received several other awards for this project in 2016 as well. Read more about the DCC here! It is the only professional organization dedicated to the decorative concrete industry and contractors who pursue the specialty market. Each year we join other decorative concrete contractors for the annual Bomanite Franchise Conference and Training Session. The Bomanite awards we took home this year were the 2017 Bomanite Custom Polishing Systems Project Gold Award. 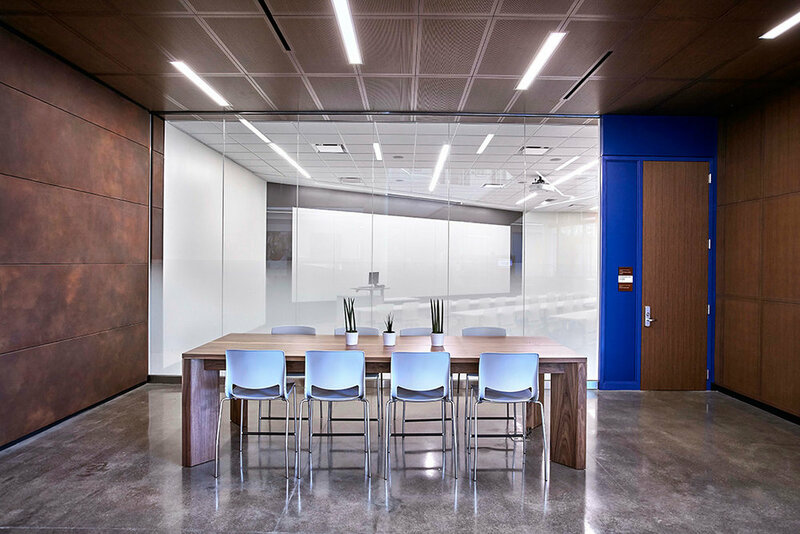 It was for the Cerner Trails polished project - design by Gould Evans. The second was the 2017 Bomanite Customer Polishing Modena Project Gold Award for MMGY, designed by Lisa Jensen Design.